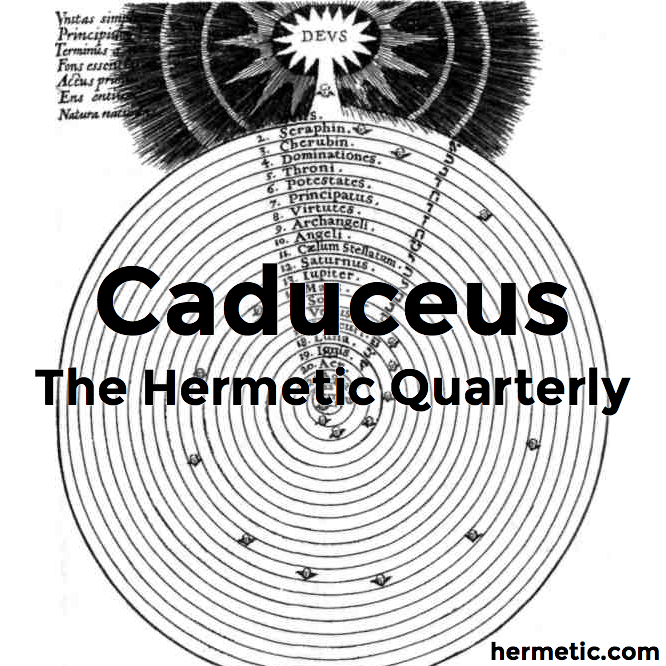 Caduceus is a quarterly journal of the Hermetic tradition, edited by Al Billings and John Michael Greer, and published by Cinnabar, [Old Address Redacted]. Subscription prices are $18 US per year within North America and $25 US per year overseas; checks should be made payable to Cinnabar. The focus of Caduceus is the Hermetic tradition in its broadest sense, including esoteric philosophy, Qabalah, ceremonial magic, alchemy, and the systems of thought and practice associated with Hermetic orders such as the Golden Dawn and the Martinist Order. A consistent goal of the journal is the creation of a bridge between the academic world and the world of the practicing Hermeticist, in which scholars and practitioners of the Hermetic arts and traditions can find common ground. For this reason we publish articles from a range of perspectives - scholarly, theoretical, and practical. In all cases, footnotes and a bibliography are encouraged. Articles in the first three issues have included “Concerning the True System of Astrological Divination”, a previously unpublished Golden Dawn knowledge lecture; “Ars Memorativa: An Introduction to the Hermetic Art of Memory” by John Michael Greer; “A Light In Darkness” by Thomas Tymme, a seventeenth-century commentary on John Dee's Monas Hieroglyphica; “The Hebrew of the Mutus Liber” by Rawn Clark; and “Having and Keeping Secrets: Some Words about Silence and the Hermetic Art of Secrecy” by Earl King Jr.